This sermon, offered by The Rev. 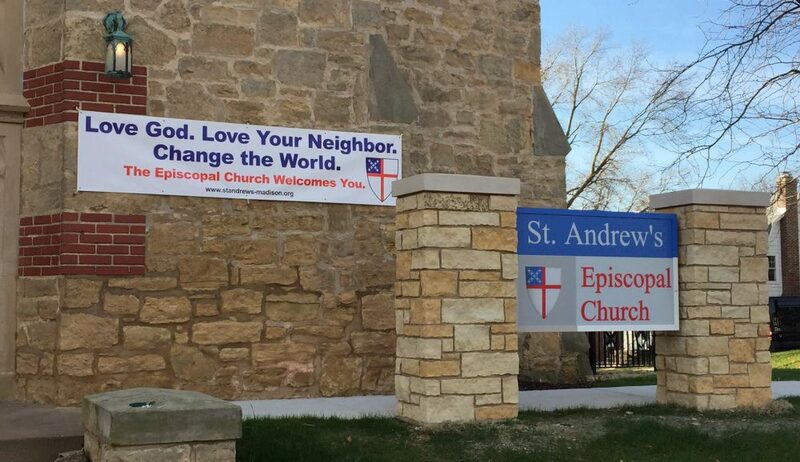 Andy Jones at Saint Andrew’s Episcopal Church in Madison, Wisconsin, on September 23, 2018 is built around the readings for Proper 20 in year B of the Revised Common Lectionary. You can find those readings here. Well I guess I just have to share with you for a moment… um, Mark is my favorite of all the Gospels. Now that may have something to do with the fact that Mark was also the favorite of my New Testament professor in seminary, and so we spent more time reading about and talking about Mark than any of the other Gospels. But Mark’s spare language, his fast pace, the drumbeat of the word “immediately,” his sense of urgency… I find all of that really compelling. And when I need to go to the Gospels to read something I invariably go to Mark first. But sometimes his urgency and his need to get right to the point, leaves us wanting more. Sometimes he leaves out the connective tissue that would help make sense of those nuggets and those important pieces that are so important for us to hear, and things don’t make a whole lot of sense. This morning for instance, in just eight short verses, Jesus tells his disciples that he’s going to die and be raised on the third day. Then they argue on the road about who is the greatest. And the scene ends with Jesus holding a child in his lap and telling the disciples that they need to welcome children in order to welcome God into their lives. “the Son of Man is to be betrayed into human hands, and they will kill him, and three days after being killed he will rise again” (Mark 9:31). Now this was the second time that Jesus confronted disciples with this truth. Just a few verses ago, in fact, Jesus told them that he would die and rise again, and Peter rebuked him, and Jesus call Peter Satan. Satan. So here, as Jesus speaks the terrible words one more time, it’s easy to imagine that the disciples were afraid to ask any questions. But there’s a lot more going on in that fear for them. They’ve left everything behind to follow him. They’ve cast their lot in with this itinerant preacher. And they’ve watched him perform miracles and teach with authority. He’s healed people. He’s fed thousands. He’s walked on the water and stilled the storm, and he even raised Jairus’s daughter from the dead. So their excitement level is just off the charts! But now, now he’s talking about leaving them. And confronted with the possibility that the one who’s done all of these things and brought them together as a community, might die: be arrested, and beaten and killed… No wonder they’re afraid. But then as they struggle with that fear, as they think about what might happen, this other reality against begins to dawn on them. And it’s not clear whether it was explicit in their thinking, or whether it was somewhere in the back of their minds. But they started to understand that if Jesus left, and they were without a leader, there was going to be a power vacuum. And so, on the road, as they contemplated all of these things, the disciples began to argue about among them was the greatest. When Jesus was gone who would be in charge? Who would drive this bus? “What were you arguing about on the way” (Mark 9:33)? “At once Jesus perceived in his spirit they were discussing these questions among themselves and he said to them why you raise such questions in your hearts” (Mark 2:8)? It happens again right here. Jesus asked them what they were talking about but he already knows. They don’t even answer him and he starts in with a lesson about power. If you would be first of all you must be the last of all and servant of all. Jesus is trying to give them a lesson on the purpose and the nature, the ends, and the meaning of power. While they had argued on the road who would get to take over this band of disciples Jesus is here telling them that powers, meaning, purpose, it’s ends, are not to aggrandize, not to protect the powerful, not to crush the oppressed, not to perpetuate systems that demean, diminish, dehumanize and destroy. Power, power is meant to uphold the weak, to reconcile the marginalized, to challenge the forces of evil that corrupt and destroy the creatures of God. And to demonstrate all of this, Jesus lifts a child into his lap. It’s hard for us to imagine how little regard there was for children in those days: no status, no rank, no power. So, Jesus was holding up the weakest of his children and saying, “If you would be first of all you must be last of all and servant of all,” and you need to welcome the weakest among us. That’s what greatness is about. That’s what power is about. Those are Jesus’s words in this moment, but his words look forward to deeds that will give us another lesson about power. Jesus is trying to explain to them that he is about to do something radically subversive. For eight chapters he’s been building up a following, a retinue. People are excited and astounded at the things that he’s doing, the miracles that he’s performed. And they’re ready to give him power and to make him king. And he’s about to give it all away. He’ll give himself over into our hands. He’ll let us beat him and crucifying him, hang him on a tree. What Jesus is trying to tell us is that the power that we have isn’t ours to keep. It’s really, if we are interested in being his followers, ours to give away. We’re not owners. We are merely stewards. And we’re called to use the power that we are given to empower others in ways that will make them whole, human, and powerful in their own right. The most insidious thing, I think, about power is that power wants more than anything to protect itself. And once we start to think that the power that we have is ours, and not a gift that we are called to give away, we tend to do anything necessary to keep it. We’ll diminish and demean others, slander them, smear them, do anything we can to silence them, to deny their voice and their power, to keep them from challenging the power that we have been given. The power that we mistakenly believe his ours to be used to build ourselves up. Jesus’s point is that the power that we have is meant to be given away to empower others, to make them powerful. And that’s so counter intuitive. Especially if you have a little bit of that stuff of your own. In the upper room, after Jesus’s resurrection, the Holy Spirit comes upon the disciples and fills them with the power to proclaim, and to preach, and to teach, and to spread the gospel. And that power is ours! We have been given power! Just think about that for a minute. Sit there. Ask yourself, “Do I feel it? Do I feel the power that I have right now?” It wouldn’t surprise me if you don’t, because the world will try very hard to make you believe that you are powerless to affect the ways that the world works. We have been given the power to speak and to act. We’re not owners of that power. We are stewards. And we are called to give that power away. And that’s a subversive thing to do. Jesus hung on the cross to give his power away. I don’t know that any of us will be called to go that far, but we may be called to take some risks; to stand up and to speak out when people are being silenced, when people’s power and dignity are being denied, when people are being disrespected in service of maintaining the power systems that already exist. We may need to take some risks, to challenge the systems and our powers that be, in order to instead live in a world that’s empowered by the love of God the love of Jesus. The good news is that we’ve been given this power as a community, as a group of people, as followers of Jesus, and we have one another, and we have the Holy Spirit; and we have this sacrament here to nourish us, to strengthen us, to feed us as we take those risks, and do that work. We are called to recognize the power that we have, to use it on behalf of others, and then to give it away. The truth is that, that multiplies the power. It’s not a zero-sum game or a fixed system. Giving the power away only creates more power, and more power is created when more power is given away. There’s a John Mayer song, I don’t know how many of you are familiar with John Mayer, but he has a line in one of his songs that says, “Power is made by power being taken, so I keep on running to protect my situation” (Vultures by John Mayer). It’s time to stop running, because power is made by power being given away. And we need to stop defending our own situation and start defending others. It is in act of sacrifice and giving that true power is made and it is through that act that true greatness, if we want to become great again, will be achieved. This entry was posted in sermons by Andy Jones. Bookmark the permalink.